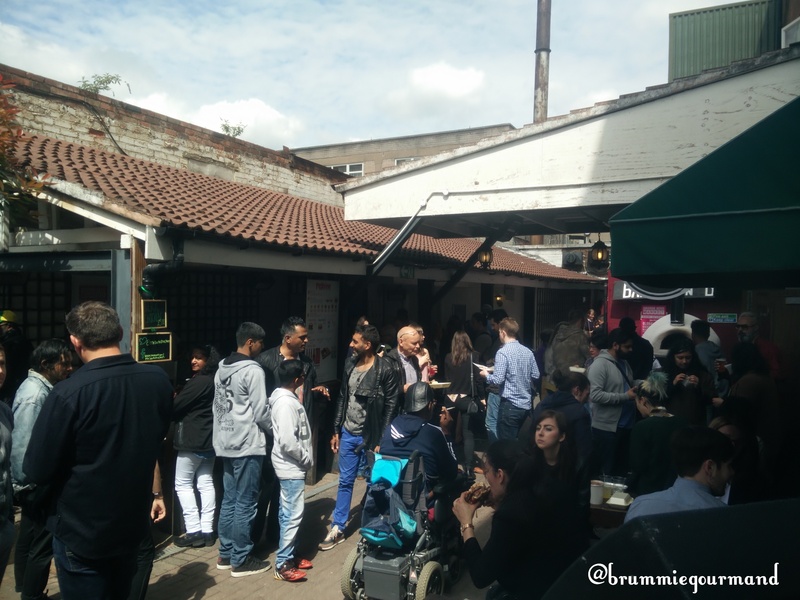 Birmingham’s having a very busy weekend! The Dragonboat Race is on at Brindleyplace, Villa are playing right now in the FA Cup and there’s a new pop-up food festival down in Southside. No prizes for guessing where I went to. Taste and Liquor opened today so there was no better way for me to start off this blog than a visit to a brand new foodie event. Open 12pm – 6pm every Saturday for now onwards, it’s designed to be a mixture of food, socialising, pop up shops and sport / film events. After a walk around Jewellery Quarter with my better half and the clock approaching 2.30pm, the tummy was rumbling and it was time for some grub. Parking nearby at the Arcadian car park It was a short stroll down to the Nightingale Club, where Taste & Liquor is based, with the tantalising aroma of Jerk Chicken, meat and sourdough accompanying the journey. Next to the LoveWaffles van and All Terrain Caffeine Land Rover on the left hand side was the entrance. A pound entry for myself and my wife got us in (it’s free for under 1’s) took us in. It was packed by the time we arrived, surely a good sign, and though in a small space there was lots of choice available. The event is open to all ages and it’s good to see a lot of future foodies enjoying the various delights available. Previously at Digbeth Dining club and Selfridges, this funky little converted mini had our mouths watering with the smell of freshly baking pizza. there was a quick turn around on orders and the staff were friendly and working well in what seemed quite a small space. There was a reasonably priced short menu of 5 pizzas ranging from £6 for a margarita to £7.50 for a speciality. I went for a beef shin ragu calzone whilst the better half chose a chicken tikka. It took about 5 minutes for the Tikka to be made whilst my calzone took a few minutes more. (Apologies for the low quality lighting on the calzone pic but we had moved inside to sit down). My Beef shin Calzone had retained its heat well (perhaps a little too well as i burnt the tip of my tongue whilst biting in!). The rich (plum?) tomato sauce gave it a good depth and balanced well with the mozzarella. The Calzone had also been sauced and cheesed on the top which is something I hadn’t seen before. The beef shin was beautifully tender and had a rich meaty taste. My wifes’ feedback of her chicken tikka was just the right amount of doughiness and the mango puree complemented the chicken well and a refreshing dash of mint yoghurt brought a nice tang. We’d both have another pizza from them in a heartbeat, but we’d share next time to allow us to try a few more vendors. Peri’os is a fast growing chain with a few locations in South Birmingham, Coventry and Oxford serving a mix of burgers, wings, burritos and salads. The grill was stacked and service was quick. I plumped for a small portion (3) of buffalo wings, costing £3.99, to round of my appetite. The staff again were friendly and the grill humming along and a small queue started to build up whilst I was waiting for my wings. After less than 3 minutes my wings were popped into my hand in a well designed tub and lid. Peering inside revealing 3 beautifully cooked wings and a mini pool of sauce. They didn’t last long! The sauce was nice balance of smoky and sweet with a spicy after kick which tendrilled up the nostrils. For a small portion the wings were of a good size and there was enough sauce to keep dipping, I’d recommend having wet wipes to hand (my wife prepared as always!) as my fingertips were swimming in sauce by the end. Unfortunately, by then we were too stuffed to try anything else, but we’ll definitely be back again, most likely with friends and hopefully sample a few more treats. Those waffles especially were calling me as we left.